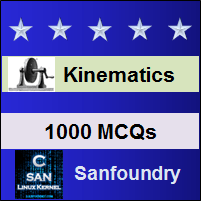 This set of Machine Kinematics Multiple Choice Questions & Answers (MCQs) focuses on “V-Belts”. Explanation: The V-belts are made of fabric and cords moulded in rubber and covered with fabric and rubber. These belts are moulded to a trapezoidal shape and are made endless. These are particularly suitable for short drives. The included angle for the V-belt is usually from 30° to 40°. 2. The V-belts are particularly suitable for _____________ drives. Explanation: The V-belts are made of fabric and cords moulded in rubber and covered with fabric and rubber. These belts are moulded to a trapezoidal shape and are made endless. These are particularly suitable for short drives. Explanation: A small groove angle will require more force to pull the belt out of the groove which will result in loss of power and excessive belt wear due to friction and heat. Hence the selected groove angle is a compromise between the two. Usually the groove angles of 32° to 38° are used. Explanation: a V-belt marked A – 914 – 50 denotes a standard belt of inside length 914 mm and a pitch length 950 mm. A belt marked A – 914 – 52 denotes an oversize belt by an amount of (52 – 50) = 2 units of grade number. Explanation: The wire ropes run on grooved pulleys but they rest on the bottom of the grooves and are not wedged between the sides of the grooves. 6. Which of the following statements are correct regarding power transmission through V-belts? (i) V-belts are used at the high-speed end. (ii) V-belts are used at the low-speed end. (iii) V-belts are of standard lengths. (iv) V-angles of pulleys and belts are standardized. V-belts are used at the high-speed end. (ii) V-belts are of standard lengths. Explanation: The belt always has an initial tension when installed over the pulleys. This initial tension is same throughout the belt length when there is no motion. During rotation of the drive, tight side tension is higher than the initial tension and slack side tension is lower than the initial tension. 8. In order to have a good grip on the pulley, the V-belt should touch the bottom of the groove in the pulley. Explanation: The V-belt may be operated in either direction with tight side of the belt at the top or bottom. The centre line may be horizontal, vertical or inclined.